In 1951 Minori Yoshida was the third generation to take over Kinzan Kiln. The Kinzan Kiln in Kutani Village was opend by Shusaku Yoshida in 1906. The kiln developed the “Kinsai” techniques. 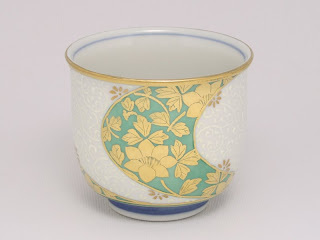 Kinsai is a type of gold leaf painting technique that continues to undergo improvements today. In 2001, the Kinzan Kiln was designated a Living National Treasure of pottery painting. Minori Yoshida, master of the Kinzan Kiln, received the Medal of Honor from the government of Japan in 2001. He has also received many awards from all over the Japan. His works were presented to the Japanese Royal Family, and some are in the collection of the Smithsonian Sackler Gallery in Washington DC. I think in the broadest terms, there are two types of kiln, both sharing the same basic characteristics of being an insulated box with controlled inner temperature and atmosphere.